Local party workers in several constituencies are angry as tickets have been given to politicians who recently switched to the BJP from other parties. 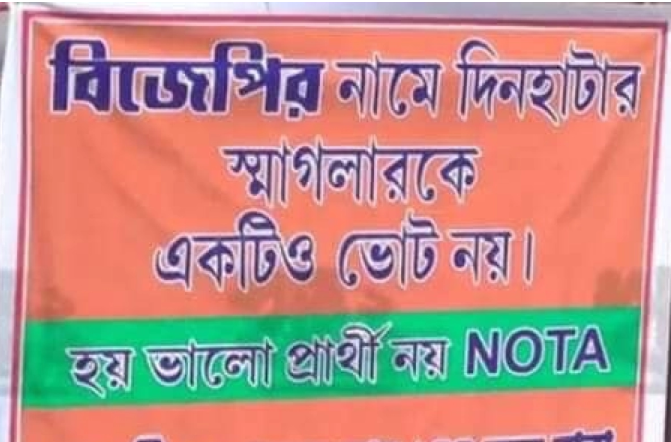 “We do not want an outsider Sayantan Basu in our constituency," a poster reads. 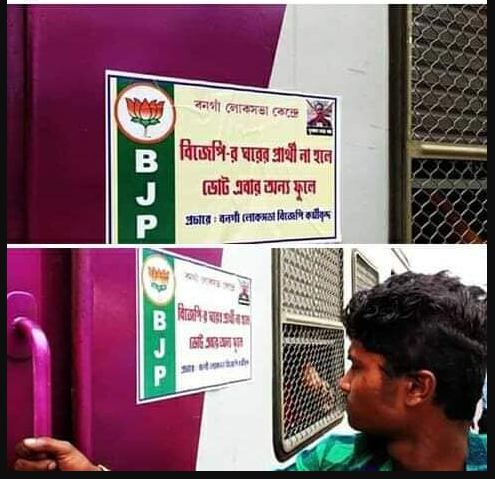 Kolkata: Discontent within the Bharatiya Janata Party’s (BJP) West Bengal unit broke out into the open following the announcement candidates for 27 of the 42 Lok Sabha seats in the state. Soon after the party put out its first list, Bengal unit vice-president Raj Kamal Pathak resigned from his post because he did not get a ticket. Pathak told The Wire that he wanted to contest from the Hooghly constituency and the party had “insulted” him by not offering him a ticket. “I have been associated with the BJP for the past 28 years, but I was denied a ticket. If I am not competent to fight an election, I am not competent to hold the party post,” Pathak said. The BJP on Thursday had announced a list of 182 candidates, including 27 from the West Bengal constituencies. Post the declaration, party workers staged a protest against the candidature of Nisith Paramanik, who was given the ticket to contest from Cooch Behar constituency in northern West Bengal. Pramanik was the district secretary of the Youth Trinamool Congress (TMC) in Cooch Behar, amd defected to the saffron party on February 28. Angry local BJP workers in Cooch Behar vandalised the party office on Thursday night, expressing dissent against the Pramanik candidature. They also blocked the car of the district president of Cooch Behar, Malati Rava Roy, and continued demonstrations. A similar incident took place in the south-eastern part of the state, in the Basirhat constituency. Here, the BJP fielded its state general secretary, Sayantan Basu. Despite Basu’s long association with the BJP, local party workers expressed their displeasure with his candidature. Posters were put up in several places in Basirhat, saying: “We do not want an outsider Sayantan Basu in our constituency. Only a local leader must be made the candidate.” Along with these words, the posters also carry Basu’s photograph. Basu accused the TMC of being behind the posters and called it a “dirty game”. “Trinamool is in the habit of playing such dirty games in politics. Did Trinamool themselves not give any seat to the outsiders in a constituency?” Basu said. 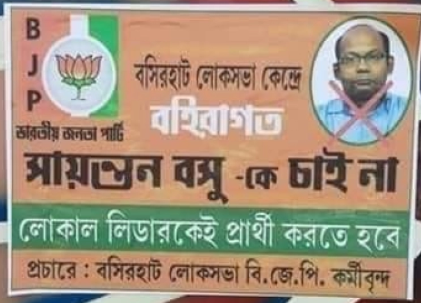 In another incident in Malda’s Habibpur, in the northern part of Bengal, posters and hoardings were put up expressing anger against BJP candidate Khagen Murmu. Murmu, who was the CPI(M) MLA from Habibpur, joined the BJP last week. Disquiet within the BJP has been brewing for quite some time now. There were several confusions within the state leadership and the central committee regarding candidates, which made groundworkers angry. The last date for filing nominations is March 25 for the two seats that go to polls in the first phase. Just two working days before the nomination deadline, on Thursday evening the BJP announced its first list of candidates. He also confirmed that the state leadership is divided over nominees, which is why it took time. “The state president sent a list to the central committee, and Mukul Roy himself sent a list separate list to the central leadership. I guess that is the reason it took so much time,” the source said. Political analyst Biswanath Chakraborty told The Wire, “BJP has no prominent face in the state, so it is struggling to announce candidature.” Moreover, the party has “no leader who has a command over its workers, hence internal disquiet within the BJP is rising,” Chakraborty explained.